A documentary crew headed by Julia Evans join an international troupe of soldiers from the Belize Defense Forces as they head into the jungle on a routine mission to plant cameras to record evidence of illegal logging operations. They come across an archaeological expedition that has uncovered a cave containing a skull of possibly alien origin but the members of the expedition have all vanished. One of the female archaeologists is later found at a farm. They come across an alien ship and are then pursued by an unseen force that wields massive firepower. Alien Origin was released by The Asylum at the same time as 20th Century Fox’s Alien series prequel Prometheus (2012). While most of the plot details for Prometheus were kept a tight secret right up until release, The Asylum have simply settled for giving us Predator (1987) as a Found Footage film (a worthy idea that you are surprised that nobody has thought of before). That and more than a few dashes of the Ancient Astronauts wackiness that we had in Indiana Jones and the Kingdom of the Crystal Skull (2008) – and Prometheus too for that matter. Alien Origin is deficient in all matters. The film consists of a long preamble that follows soldiers and a film crew into the jungle. Various things happen but it isn’t clear what. 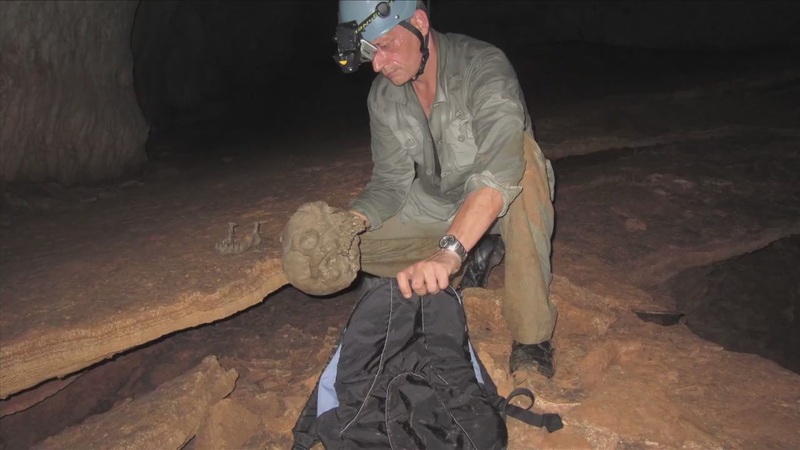 The group come across an archaeological dig that has uncovered an alien skull deep inside a cave. The archaeological team have vanished but one of the women is later found, having mysteriously turned up on a Mennonite farm. They come across and board an alien ship but nothing happens there despite much frenetic running through half-lit corridors. Usually in a film like this, you have some notion of what the group are fighting against by at least the halfway point but you are still trying to get an idea 70 minutes in (out of an 88-minute film). The last twenty minutes of the film consists of lots of action with the soldiers shooting at something in the jungle and fleeing as it bombards them with a massive amount of firepower but we never get the slightest idea of what it is until the last two blurred shots. The sheer vagueness regarding what is happening throughout kills the film. There is a lame and contrived coda ending that tries to tie everything to human origins. Director Mark Atkins is an Asylum regular was has also made Halloween Night (2006), Allan Quatermain and the Temple of Skulls (2008), Dragonquest (2009), The Haunting of Winchester House (2009), Princess of Mars (2009), Battle of Los Angeles (2011), Sand Sharks (2011), Jack the Giant Killer (2013), Knight of the Dead (2013), Android Cop (2014), Dragons of Camelot (2014), P-51 Dragon Fighter (2014), A Perfect Vacation (2015), Road Wars (2015), Planet of the Sharks (2016), Empire of the Sharks (2017), Jurassic School (2017) and 6-Headed Shark Attack (2018).